On a clear day in Venice, take a moment and look inland to north-north-west. On the horizon, shimmering in a lagoon haze, are a range of hills forming the first outliers of the alps, some 60 km distant across the pancake-flat land of the pianura. 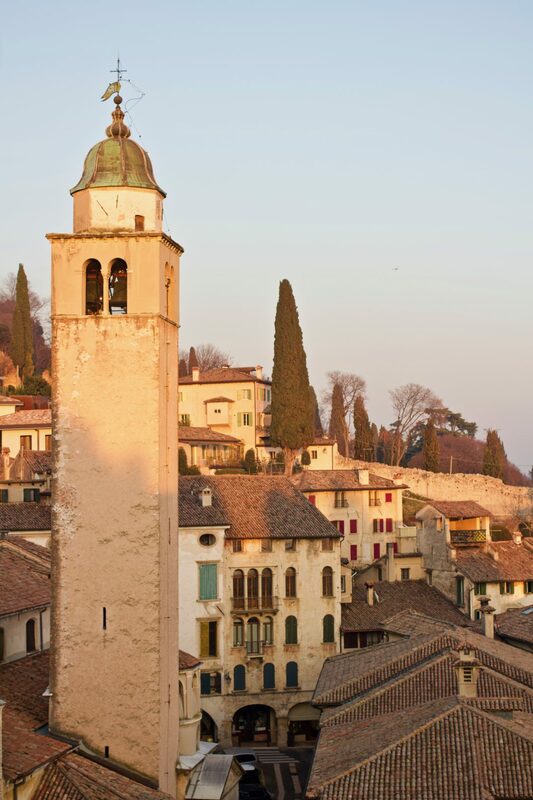 Here lies the town of Asolo; perched on the Colli di Asolo hillside. It’s where this story begins. 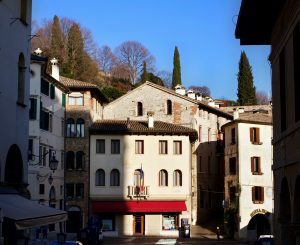 Asolo has existed since pre-Roman times. Known as the “Pearl of Treviso province”, or the “City of 100 horizons”, it became a Venetian fiefdom once ruled by Caterina Cornaro, Queen of Cyprus. Meanwhile, the profusion of white Mulberry trees recalls its past importance on the Silk Route. A Venetian playground then, a quiet haven for those wanting to escape Venice’s summer heat and humidity, or its winter floods and fogs. Indeed, this is a place of balmy Mediterranean sea breezes, peppered with grand Palladian villas and Renaissance gardens. A romantic description perhaps, yet Asolo is. After all, this is where poets Robert and Elizabeth Barrett Browning came to stay. Indeed, Asolando was Robert Browning’s last book, published on the day of his death. This town has always been a magnet for artists and actors, writers and travellers. Asolo has even given the Italian language a verb, Asolare. It means to take a breath of fresh air and the carefree feeling that this brings. 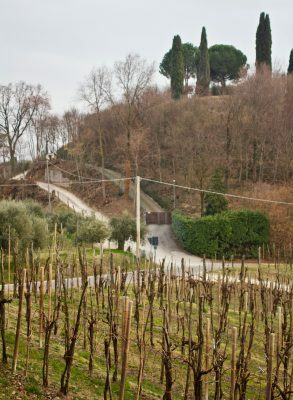 It’s time to weave Prosecco into Asolo’s story. Perhaps we think we know Prosecco all too well. After all, the UK alone takes 20% of its enormous production, meaning 35% of all its exports. It’s the white sparkling wine that’s ubiquitous in our bars, cafes and pubs. We see it as sharply-priced, soft and off-dry. Commercial froth then, a fun wine for celebrations, aperitivo and as the base wine for cocktails like Bellini, Aperol Spritz and Sgroppino. Considered by some as poor-persons Champagne, by others as an affordable alternative. But it’s worth getting to know Prosecco better, as there is more to it than meets the casual eye, especially regarding style and quality. There are toothsome and characterful Prosecco wines, and nowadays some have the potential for greatness. 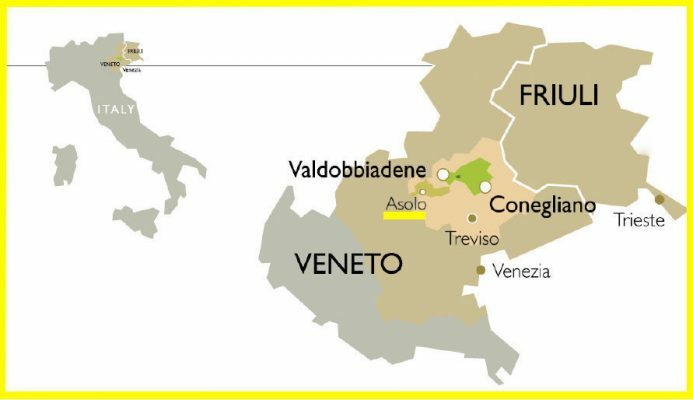 The Prosecco DOC is vast, stretching across the two Italian provinces of Friuli and Veneto. There are some 23,300 hectares, with growing production now exceeding 450 million bottles every year. Double-digit growth has followed insatiable demand over the past two decades. Half a billion bottles annually can’t be far away. While this volume is phenomenal, some suggest that we may have reached “Peak Prosecco”. Others even predict that the “bubble” (sic) will burst when consumers become bored and look for alternatives. My view is that Prosecco will continue to be the engine of sparkling wine sales. Meanwhile, Prosecco became protected from increasing mimicry by other regions and countries in 2009. Hence the primary grape variety, once known as Prosecco, is now officially called Glera. In short, Prosecco is the name of the wine. It must be from Glera and other authorised grape varieties within the DOC. Anything else can’t officially be Prosecco, at least in Europe. Glera is the basis of Prosecco, an indigenous semi-aromatic grape variety. It may originate from around the town of Prosecco, maybe from Treviso, or even come from Croatia, where it’s also grown. Under the DOC rules, Prosecco must contain at least 85% Glera, with other allowable varieties (Verdiso, Blanchetta Trevignana, Penera, Boschera, Chardonnay, Pinot Gris, Pinot Bianco and Pinot Nero vinified white) up to 15%. Many bottles contain 100% Glera. A Rosé version, combining Glera and Pinot Noir vinified red, is likely to be produced in the DOC soon, having won approval. Meanwhile, there are sweetness levels which apply in Prosecco DOC. From driest to sweetest, these are Extra-Brut, Brut, Extra-Dry, and Dry. Extra-Brut is from 0 to 6 grams of sugar per litre; Brut is 6-12 g/l. Extra Dry (off-dry) wines range from 12-17 g/l. Confusingly, “Dry” Prosecco wines are the sweetest, with 17-32 g/l. Though there are rare examples of still Prosecco (Tranquillo), most are fizzy; sometimes Frizzante (lightly sparkling) but mostly Spumante (fully sparkling). Sparkling Prosecco DOC has to use the Charmat (Martinotti) pressure-tank method. Some see this process as inferior to Método Classico. However, it serves the fruitiness of the Glera grape variety perfectly well. See my piece called I’m Forever Making Bubbles about the different ways of sparkling winemaking. While (with notable exceptions) much of the DOC continues to pump out inexpensive commercial fizz from high yield vineyards on flat land, producers are increasingly diversifying and releasing premium bottlings. Indeed, those around Treviso and Trieste can append their names to the DOC to indicate better quality. While the dominant style remains Extra-Dry, there are also more styles emerging and gaining ground, thanks to improvements in winegrowing and winemaking. Not only are the best producers imbuing Prosecco with a sense of place; their wines are food friendly too. These are the higher quality wines. They may cost a little more yet they retain a strong value proposition. Such quality innovations are led by Prosecco’s two (and only) Superiore DOCG enclaves. Also created in 2009, these enjoy a reputation for higher quality, though remain stubbornly less well known to many in the UK, with only 6% coming to the UK. The larger DOCG is around the towns of Conegliano and Valdobbiadene. That covers 6,860 ha in size and makes 90 million bottles each year. It has created new subzones and has many excellent producers. However, their story must wait for another time. However, just to the south and west of this DOCG, and separated from it by the River Piave, are the south-facing hillsides of the Colli Asolani and Montello. Here lies the smaller Asolo Prosecco Superiore DOCG, of 1,783 hectares and 13 million bottles. Generally speaking, these two prestigious DOCGs are a reliable source of the best Prosecco. Both DOCG’s have similarities; having lower yields, hillsides, and higher minimum alcohol. Both, unlike the DOC, avoid the humidity of the lower flat land and have also rejected the possibility of making a Prosecco Rosé in future because it’s not traditional. Also, there is scope here to make Prosecco using the Método Classico method, just like in Champagne and Franciacorta. The DOCG producers range from small artisans to large enterprises, with a real focus on quality and a sense of place. There are also significant differences between these two DOCG’s. Asolo is a little lower at a maximum of 450 metres, and its hills are mainly south facing. It enjoys warm Mediterranean breezes by day and colder winds from the hilltops at night. This temperature variation preserves acidity and means the vineyards are slower to warm up in the mornings, so there is more extended and more gradual grape ripening. In summer, 33°C in the day will drop to 15°C at night. There are ten different soil types, including glacial moraine, alluvial fans from stream wash, and gravels along the right bank of the river Piave. Limestone soils are on the hilltops. In contrast, Conegliano-Valdobbiadene can be higher and steeper, as well as colder and wetter, especially when Alpine winds blow down from the Dolomites. One technical fact that differentiates Asolo Prosecco is its amount of Dry Extract. Before your eyes glaze over, this the residue of solid stuff left after removing all the water and alcohol from the wine. The minimum is 15 g/l, but Asolo Prosecco frequently has 18 g/l or more. It doesn’t sound much difference, but the effects are considerable. Firstly, it leaves an impression of more weight and body in the wine. Secondly, it enables ageing. Most Prosecco is best when drunk young, but Asolo Prosecco also ages well over 5-7 years, which brings additional honeyed tones. Lastly, it means that these wines can come as an Extra-Brut bone-dry style (0-6 g/l residual sugar) in addition to the others on offer. This style is the crispest and most refreshing. The lack of sugar also reveals the terroir aspects of the wine, such as minerality and subtler aromas and flavours. Sugar can mask poor winemaking, just like noise masks the sound of music. Hence such naked wines demand the best grapes and the most skilled winemaking because there’s nowhere to hide. This style has other advantages too, in that it’s meeting rising consumer demand for drier fizz and it’s also a more versatile style for food pairing. Asolo DOCG adopted this style in 2014 and Conegliano-Valdobbiadene DOCG will follow suit shortly. 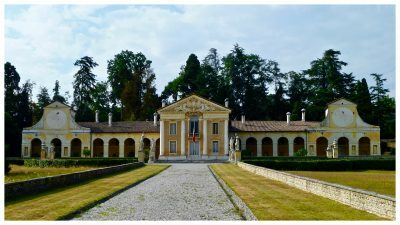 Villa Barbaro, Maser, near Asolo. Palladian splendour. Hence in Part 2, it’s time to Asolare. It contains a personal selection of Asolo Prosecco Superiore DOCG bottles, made in a wide range of styles, together with some food matching ideas. I’ll also introduce an excitingly different yet re-emerging style, called Col Fondo. I dedicate this article to Armando Serena, Presidente of the Consorzio Vini Asolo Montello. With thanks.